A cat bite during pregnancy typically don't pose any risk to your baby. 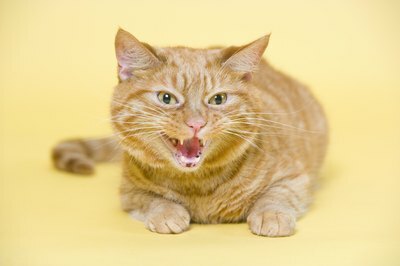 Having a cat means suffering the occasional bite while playing, being in the wrong place at the wrong time or catching him in a bad mood. Normally this isn't much more than an annoyance, but having a bun in the oven could cause some understandable concern for the baby's safety. It's happened to most cat owners at one time or another – you're happily playing with Tiger when all of a sudden he swings around and gives you a nip on the hand. Usually he wisely runs off immediately after, but the damage is done. As you nurse your hand, you worry about the implications of that quick nip, to you and your growing baby. Your cat's mouth is positively squirming with bacteria, with Pasteurella being the most common variety passed into a bite wound. And since a cat's teeth are long and sharp, they create perfect little puncture holes, which can also become infected with external bacteria. If left untreated, those few tiny holes in your hand can become quite infected, causing you pain, swelling and even permanent tissue damage. With sharp claws and a mouth full of pointy teeth swarming with bacteria, it's no wonder there's long-standing advice for pregnant women avoid cats. But fear not, for although Tiger's little not-so-love bite could lead to an unpleasant infection for you, the baby in your belly should be completely unaffected. But that's not to say that you should just ignore any possible infections from that bite. Your body is already working hard to supply your growing baby with everything necessary to be healthy. It's got enough to do without having to deal with a cat bite infection on top of that. Chances are the first thing you do after being bitten – after tossing a few choice words in Tiger's direction – is head to the bathroom to clean the wound. Excellent decision. Use plenty of soap and water to wash out the wound and scrub gently to make sure you get them as clean as possible. Rinse thoroughly, then slather that puppy with an antibacterial ointment and cover with gauze. Keep an eye on it for the next few days to catch any signs of infection, such as a redness, pain or swelling. If you suspect an infection, or you just want to set your mind at ease, call your doctor and discuss the situation. He may want you to come in for some antibiotics or to just check out the wound and make sure it's completely clean and in no danger of infection. Traditionally, cats and pregnancy are a big no-no and one reason is the fact that they can transmit a disease called toxoplasmosis to pregnant women, which can cause damage or death to the unborn baby. This transmission comes not from a bite, but from an infectious parasite in your cat's poop. Cats contract this parasite from infected prey animals or contaminated raw meat. Although your strictly indoor cats most likely don't carry the parasite, outdoor strays might and could use your perfectly tended garden as their litter box. Always use gloves when working outside in soil, or when cleaning your litter boxes, and wash your hands thoroughly afterward. The parasite is transmitted to humans through ingestion of the infectious stage, meaning as long as you resist the urge to lick your fingers or rub your eyes as you garden or change litter boxes, you should be fine.